All of these Blue Mountains day hikes have the sort of sensational scenery the region is renowned for, and each track can be done in a day or less. These day hikes are also all close enough to a train station or bus stop that they are achievable no matter how you’re making your way around. 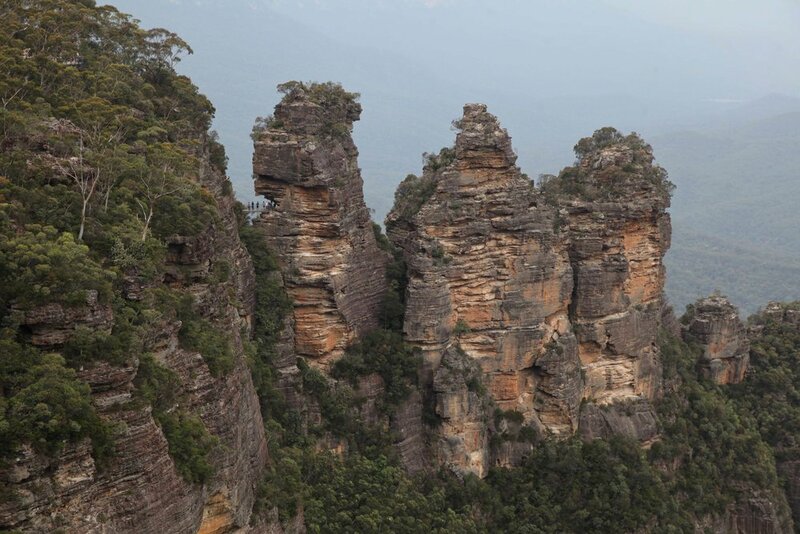 Blue Mountains icon: the Three Sisters viewed from the lookout at Echo Point in Katoomba. 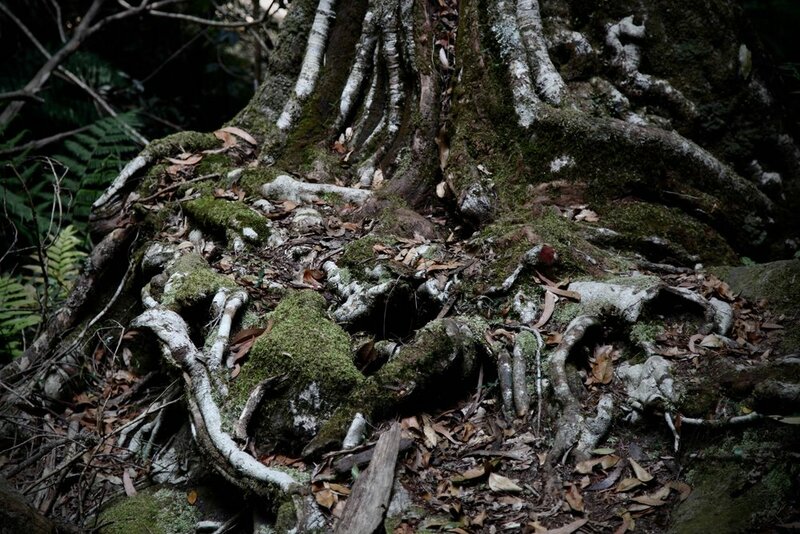 Dardanelles Pass and Fern Bower: head to Katoomba. Your starting point is the lookout at Echo Point, where you can take in the grandeur of the Jamison Valley and its most famous landmark, the Three Sisters. Next it’s down the Giant Stairway, along Dardanelles Pass through Leura Forest, and up via Leura Cascades to Prince Henry Cliff Walk finishing up at Leura. The cliffs at Leura have a few excellent lookouts, so if your timing puts you there around sunset, try stopping by Elysian Rock, Olympian Rock, or Gordon Falls. Whether you’re entertaining visitors from out of town or are just eager to experience the iconic scenes the Blue Mountains is renowned for, this day hike has a bit of everything. The Three Sisters and the epic valley views, forest and ferns, plus waterfalls. 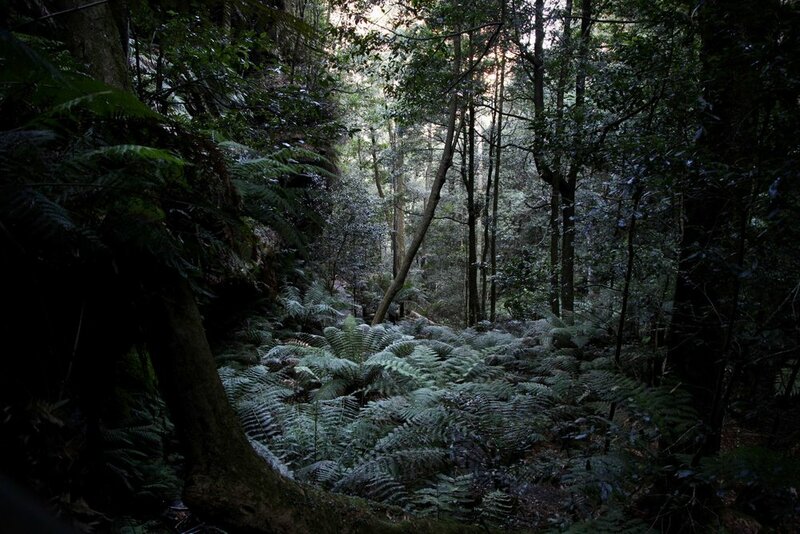 The Grand Canyon loop track is full of lush ferns and mossy trees. Grand Canyon Loop Track: if you’re driving you can park at Evans Lookout where you can start and finish your walk, this gives you a loop track hike that is just over 6km. If you’re catching the train, a great way to do this walk is to combine it with the Cliff Top Track — walk from Blackheath train station to Govetts Leap, along the Cliff Top Track to Evans Lookout, around the Grand Canyon loop, back along Cliff Top to Govetts Leap, returning to Blackheath train station. This walk is 18km return. If you time it so, you can take in sunset at Govetts Leap on your return. By this time you’ll have well and truly walked up an appetite — why not stop in at the New Ivanhoe for a pub meal in a cosy setting? After all, you’ll be walking right by it on your way back to the train station. Pulpit Walking Track: this track begins at Govetts Leap, and heads out to Pulpit Rock. This one isn’t a loop track, so you return the way you came. It’s 7km return to Govetts Leap, or 13km return from Blackheath train station. You can knock this hike out in a matter of hours, giving you plenty of time for a long lunch and an afternoon exploring the rest of what’s on offer in Blackheath and surrounds. 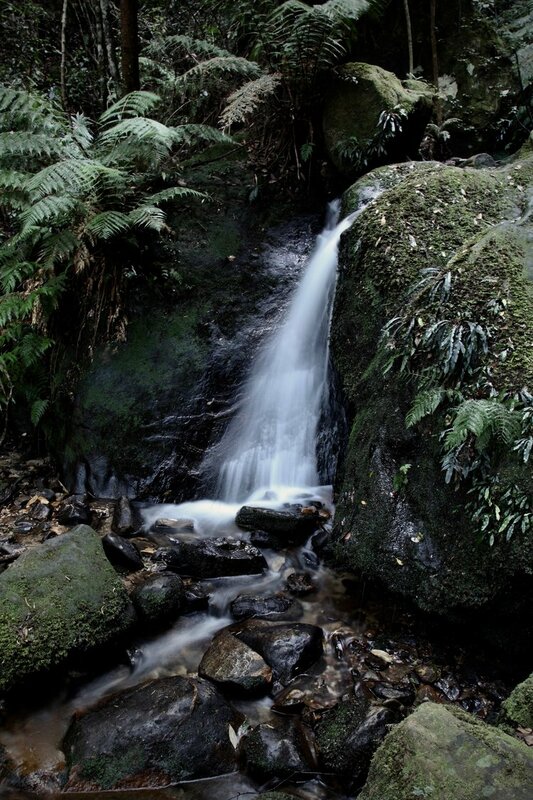 Narrow Neck Plateau: this is your one day Blue Mountains epic. From Katoomba station return you’re looking at just over 30km. If you drive you can cut your kilometres down a bit by parking in the car park at the locked gate on Glenraphael Drive. Though, at 20km return, it’s still a decent day hike. With its sweeping valley views over both the Jamison Valley and the Megalong Valley — this is a rewarding adventure. Make sure you start early, be prepared for the weather, and bring plenty of food and water. If you’re back in time for sunset, head up Cliff Drive for a vantage point from Narrow Neck Lookout or Cahill’s Lookout. Cliff Top Track: this track starts at Govetts Leap and runs through to Evans Lookout. You can do it as a loop from Blackheath train station, where the walk will run you around 12km all up. This is a great Blue Mountains day hike because it follows the cliff line giving you views out across the valley for almost the entire walk. With lookouts at both ends, you can take a break and soak up the views that people from around the world flock to the region to witness. The Cliff Top Track can be done in 2-3 hours leaving you plenty of time for a picnic lunch at one of the lookouts, or in nearby Blackheath.